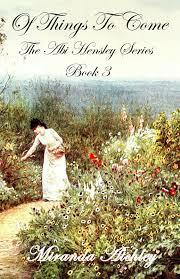 This is the 3rd book in the Abi Hensley series and it takes place just after WWI. Abi is also saddened by the death of her friend Mrs. Wood. Depression sets in and Abi finds herself with writer's block that lasts for most of the first half of the story. Being pressured by her publisher and from fans and friends that are waiting for another book from her Abi tries a different genre of writing. All of Abi's friends try to encourage her and help her out of her depression. One poor review sends Abi into a tailspin of doubts and disappointment. Will she be able to set her disappointment aside and get over the crippling writer's block or will Abi need to retire her typewriter and find another career? It was fun to read about some of the fashion changes in OF THINGS TO COME. The clothing of the 20's and the changes for women's rights fit Abi's independence perfectly. As the reader I would have liked to have seen Abi more involved with the Women's Suffrage movement. There were mentions of Abi going to meetings, but not enough information of her involvement. It was fun getting to read Abi's interaction with old friends. Especially the ones at the boarding house she stayed at when she first arrived in New York. Abi's trip to one of her favorite characters hometown was fun. Abi's parents were a mixture of supportive and annoying! OF THINGS TO COME had it's sweet moments and it's frustrating ones as well. Getting glimpses of the changing times was fun, but Abi's continued writer's block and depression went on a bit too long. I love that Abi is a dreamer and goes after her dreams. I love that she has friends of all ages and that she is generous and kind to those she comes in contact with. I also love her strong character of not letting people(particularly men) walk over her. The ending was a bit abrupt, but definitely was a lead in to book 4.